Julie Congress is a founding member/Co-Artistic Director of No.11 Productions and is an actor, director and voiceover artist. Directing credits include: Survived By (Columbia University/3LD), Greatest Place on Earth (NYU), The Acharnians (Assistant Director, Stella Adler Studio of Acting), Places (No.11), The Elephant Man - the Musical (No.11). Selected acting credits: If (Eugene O'Neill Theater Center), Quest for the West: Adventures on the Oregon Trail! (Kentucky Repertory Theatre), Coosje, A Christmas Carol, Medea (Medea), Lysistrata, MythUnderstood, Jet of Blood. 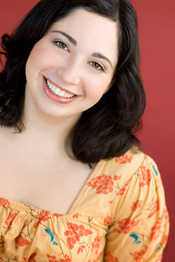 Julie holds a BS in theatre from Skidmore College, studied at the Moscow Art Theatre School and is New York Thespians (Educational Theatre Association) Chapter Co-Director.